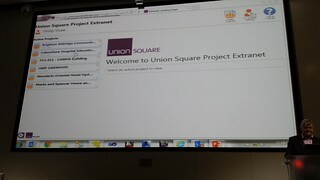 Union Square is now embracing the AEC ‘extranet’ world it once avoided, and is going mobile with its workflow. Today’s 12th Union Square user group conference at the Royal College of General Practitioners in London saw the launch of the Nottingham, UK-based software vendor’s contract administration module, plus announcements about forthcoming mobile and ‘extranet’ functionality. In its early days around 2000, Union Square rode the wave of construction interest in online project or document collaboration, but – in the face of stiff competition from pure Software-as-a-Service ‘extranet’ providers – it reverted to its core intranet business. As a result, it has grown a thriving business, now turning over £6.1m, up from £5m in 2013) based on delivering mainly on-premise document sharing software, predominantly to UK SME architectural firms, other AEC professionals and contracting businesses, plus project accounting functionality (expanding since its introduction in 2010). Architect firm delegates comprised just over a third of the event’s attendee list (57 out of 147), with the balance equally shared between other professional services and contractors (45 each). MD Richard Vincent welcomed delegates to the conference, highlighting the company’s continued growth and new customers. Union Square has got its first customers in north America (Integral) and Scandinavia (Tengbom), and now has 12 customers in its strategically important Australian market, he said, before starting to introduce the day’s main announcements where “workflow is everywhere“. 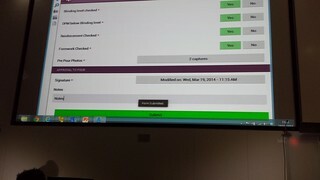 These included a new contract administration module, plus announcements about mobile and extranet tools. Changes to Union Square’s document management capabilities were reviewed, then document (drawing) lifecycle management – the interface all very Microsoft-ish in appearance, reflecting its software architecture and its integration with Outlook in many organisations. The system’s commenting/mark-up tool is no longer a plugin – a toolbar appears in the drawing view and the tools (cloud, arrows, etc) work straight from the browser (questioning revealed some users still use alternative and more highly featured viewing solutions). need to seamless fit into the larger process. The first app is available for Android devices from Google’s Playstore, but Union Square is also going down the Apple iOS route (perhaps surprisingly, there was no mention of Windows, despite their systems’ Microsoft foundation; other AEC vendors have different OS preferences – Asite, for example, said on Monday its mobile tools were iOS first, then Microsoft, then Android). Richard demonstrated a site inspection process, showing how data could be synchronised before a user went out on site, how data could be entered into the interface, adding photographs, then signing off the process (signatures were time-and date-stamped, with GPS coordinates included to add further evidence of the site-specific, contemporaneous reporting). Upon return to the office, that data is synchronised, and all information and any associated photographs are immediately available to other users on the main Union Square platform. Phil Shaw presented the contract administration and extranet overviews. He demonstrated configuration of typical request for information, RFI-type processes and how these could be routed for approval, reply and completion (all pretty much standard on the SaaS platforms I know), but there was no discussion of specific sets of workflows to support particular contract types (eg NEC3, JCT, etc; this field is also contested by several SaaS ‘extranet’ vendors plus contract change management specialists such as Sypro). The extranet functionality, Phil said, was “A departure from the traditional Union Square model, allowing outside people to enter the secure, shared online environment and view and interact with information”. The extranet is typically created as a separate space from the document management system (so there may be some potential duplication of data held in internal systems); it can be internally hosted, or held in an external data centre (Stuart Bell told me that around 30 customers have taken this option, and that demand for the extranet module had been driven almost solely by the company’s contractor customers). It will typically be licensed on a per-project basis. As with most other AEC extranet solutions, external users are issued with logins for access, and viewing, upload and other rights can be controlled at the individual level. When users access the system, they can view all the projects they are authorised to see, and – depending on their access rights – interact with other users, including via the contract administration workflows. Union Square’s software development is plainly driven by the priorities of its users who are, for the most part, dealing with the ongoing challenges of managing day-to-day construction operations within which email remains the predominant communication channel. Opening up mobile and extranet channels to reduce some email traffic will clearly help, as will a planned public API to aid integration with third-party, mainly back-office applications. However, it appeared that most of the company’s customers are collaborating mainly on documents and 2D drawing outputs. BIM was only discussed very briefly during the morning (I was not allowed to attend an afternoon break-out session where users were to discuss BIM experiences and needs); Union Square is setting up a customer BIM group, looking at IFC issues, and exploring how it might share model data via its extranet. I talked briefly with Union Square directors Richard Vincent and Will Yandell (over from Australia), and commercial lead Stuart Bell at lunchtime afterwards and they said few customers were actively discussing BIM – perhaps a reflection of current levels of BIM interest among their largely SME customer base. Paul, thanks for coming along to USUG2014, it was good to catchup and chew the cud in a few things. – In 2000, the direction and strategy of the business was set on internal information management helping to resolve the issues of disaggregated data and the chaos of working in network shares and overlays. The extranet boom and bust of 2000-2001 didn’t interrupt our strategy. Clearly, the importance of managing the project space between organisations is very important to us today and hence the variety of tools for information exchange and collaborative working. – the balance of professional services to contracting organisations in our client portfolio is almost 50:50. As you might imagine, a London based event attracts mainly local practices. Our regional user gatherings represent our client split more evenly. As we have over 25% of the AJ100 architects as clients, you are right to identify the balance. – your comment that Union Squares clients mainly work with 2D deliverables needs correcting. It is doing a huge disservice to the capabilities of a very talented group- many of whom have used modelling applications for many, many years. Whether it is signature architects, lead MEP consultants, contractors or lead single trade contractors – many of these clients have been working with IFC, model data and supporting the formal issue and exchange if this for many years. – BIM is a very strong strategic consideration for Union Square. The current solution set across the industry is dominated by point solutions supporting design, review, analysis etc. The percentage uptake of projects delivered in a BIM methodology remains low (but increasing). BIM is not the domain of large companies, however my traveling observations are that tier 1 contractor and consultants are best positioned from a procurement perspective to drive forward in this area. A lot of the innovation is being driven through SME’s though. If (amongst lather things) BIM is about digitising construction and better enabling sharing, collaboration and quality control of deliverables to clients – that is absolutely central to what Union Squares does. As protocols settle, and information life cycle needs are better unrestored, our clients will be able to clearly articulate how Union Square can support their BIM delivery process. Revit integration, template and quality management of documents, information exchange solutions and extranet are demonstrable and is use in our solution for exchanging model data and the industry dominant 2D deliverable. Integrated IFC viewing and data management are active projects for us in 2014. We are excited at the prospect that our BIM task group will cement many of our R&D features as required functions in our rich feature set. We remain keen for you to gain a deeper understanding of Union Square as an AEC focused Enterprise management system that support improvements in efficiency, quality, value and controlling risk. BIM is but one aspect affecting the macro environment that our clients are looking for direction on – as you learned on Wednesday, there are many other areas of business operations that have equal importance and are apparent and demonstrable in the volume of real work and requirements being delivered in 2014. Let’s keep the dialogue open on this! P.s. Thank you for the promotion to Director – whilst this role is in my sites, my current role is ‘Commercial Lead – U.K.’responsible amongst other things for driving our presence in the market and maintaining the fabulous run rate growth balanced with quality of delivery in the market. Regarding the 2D point and BIM points – I completely appreciate that many firms will have been working in 3D, IFC, etc for many years. However, the impression given from the presentations and discussions that I saw/heard was one largely related to exchange of 2D information, and the morning’s mention of BIM took less than a minute. Perhaps I would have got a very different view if I’d had been able to listen (perhaps under Chatham House rules or an NDA) to the BIM and extranet break-out discussions? As you say, while there is a lot of push from Tier One contractors, there are also many SMEs innovating in the BIM arena – I’ve been to a couple of BIM4SME events and some SMEs are also active in communities like ThinkBIM. BIM is currently an ecosystem of numerous tools, some directly related to authoring (and it’s not all Revit), others are point solutions helping with coordination, visualisation, etc (I liked a comment from someone recently that their most frequently used BIM application was Word – they were writing a lot about BIM protocols, contracts, IP, etc). Therefore, it is vital, I think, that software vendors participate in ongoing discussions about BIM and what it means for their users and for interfaces between their software tools and other parts of the BIM ecosystem, and I look forward to seeing and hearing more about Union Square’s involvement with these developments.